TWO PERFORMANCE ARTISTS AUTHOR SIGNING IN BURBANK! Author Scotch Wichmann will be selling & signing copies of Two Performance Artistsfrom 1-4PM on Saturday, October 21 as part of the Burbank Library Local Authors' Showcase! Stop by and check out 50 awesome local authors! At Buena Vista Branch Library, 300 N. Buena Vista St., Burbank, CA 91505. FREE! 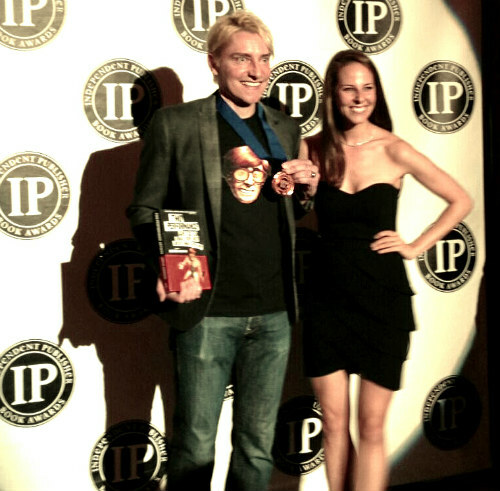 TWO PERFORMANCE ARTISTS TIES FOR SILVER AT THE IBPA BEN FRANKLIN AWARDS IN AUSTIN, TX! Two Performance Artists just took another national award, this time tying for Silver last week in the Best New Voice category at the Independent Book Publishers' Benjamin Franklin Awards in Austin, Texas! IBPA is the largest independent book publishing organization in the U.S.—what an incredible honor! Thank you, IBPA, and congratulations, Scotch Wichmann! Two Performance Artists was just named a Finalist in the 2015 Independent Book Publishers Association Benjamin Franklin Awards for Best New Voice in Fiction! IBPA is the largest independent book publishing organization in the world, so this is quite an honor! Two Performance Artists author Scotch Wichmann performed Doppleganger, his newest performance art work in Ventura, California to ring in the new year. He also wrote about what the Sheep means to him. INSPIRED BY MATT DAMON: DICKTEMP! In a wild new art experiment inspired by Jason Bourne, Scotch Wichmann is taking the temperature of his "man parts" 24/7 for the 30 days of November at www.dicktemp.com. You can also follow #dicktemp on Twitter. 'TWO PERFORMANCE ARTISTS' TAKES BRONZE MEDAL IN 2014 INDEPENDENT PUBLISHER BOOK AWARDS! Two Performance Artists has won a Bronze Medal in the 2014 Independent Publisher Book Awards for Best Regional Fiction out of 5,600 total entries! Get your copy! 'TWO PERFORMANCE ARTISTS' TOUR BEGINS! 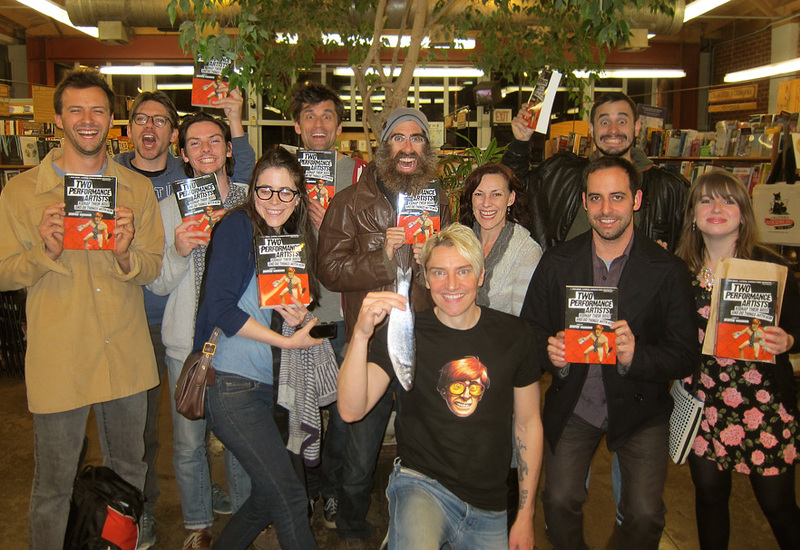 Author Scotch Wichmann kicked off his new novel's tour at Skylight Books in Los Angeles this past week to a standing-room-only crowd with a killer reading & performance—and there are a lot more tour dates coming! Also, Freakshow Books' official TWO PERFORMANCE ARTISTS store at Zazzle.com is also now open for business, with awesome performance art shirts, hats, and bumper stickers for sale. Come fly your freak flag! 'TWO PERFORMANCE ARTISTS' OFFICIALLY LAUNCHES IN JUST 30 DAYS! The official U.S. launch of TWO PERFORMANCE ARTISTS is just 30 days away! Mark April 10th on your calendars, when the debut novel by performance artist Scotch Wichmann will be available at bookstores everywhere in both paperback and E-Book formats. SCOTCH WICHMANN PERFORMS IN SAN FRANCISCO'S "100 PERFORMANCES FOR THE HOLE"
Performance artist Scotch Wichmann was selected to perform at precisely 11:34PM on January 4th at '100 PERFORMANCES FOR THE HOLE', a show at SOMArts in San Francisco that featured 100 consecutive performers who each performed a 4-minute piece. Info available here. 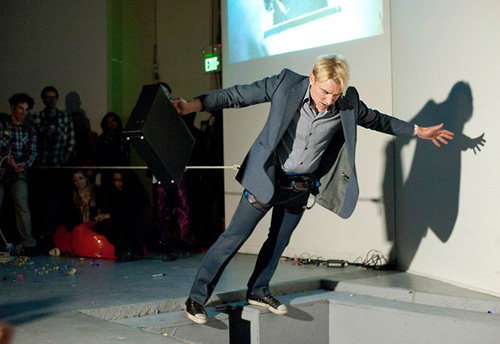 Scotch Wichmann will perform ECHO, a new work about anticipation and the unconscious, at the popular 5x5x5 performance art show in downtown Ventura, CA this Friday. Seminal performance artist and painter John M. White will also perform, and each attendee will receive a free TWO PERFORMANCE ARTISTS bookmark designed by Scotch. Dec. 6 at 8PM. Free admission. Sylvia White Gallery, 1783 East Main Street, Ventura. Details here. The video trailer for TWO PERFORMANCE ARTISTS is finally here! Directed by the author Scotch Wichmann, it'll give you a small taste of the strange & wonderful things to come. Click here to watch it on YouTube. We just signed Scotch Wichmann's debut Two Performance Artists Kidnap a Man and Do Things With Him, a madcap caper about two wild San Francisco performers who try to turn their billionaire boss into a performance artist. The book was an Amazon Breakthrough Novel Contest first-round finalist, and will be published in Spring, 2014.�Learn more here. Bring on the weirdos, wackos, and wonders because Freakshow Books is open for business! Stay tuned for our first book title announcement!